(0 Customer Reviews) | Write Review 2 issues per year BuildHome offers a comprehensive guide to the latest home designs from custom builders, project home companies, knockdown-rebuild specialists and kit-home suppliers who service Victoria. BuildHome is published to suit specific markets catering for builders, suppliers, and consumers interested in boutique homes in Victoria. The publication is a definitive guide of inspiration for those looking to buy or build a new home. Start creating your dream home and download your edition today and never miss an issue. BuildHome launched 22 years ago and is the definitive guide for those looking to buy or build a new home. BuildHome is published to suit specific markets to cater for builders, suppliers and consumers for boutique homes in Victoria and selected builders from other states. BuildHome showcases a variety of new homes including; Custom-built homes, Display homes, Energy space-efficient homes, Kit homes, Pre-fabricated homes, Transportable homes plus specialist products and services. 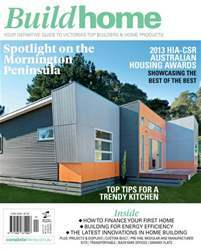 BuildHome offers a comprehensive guide to the latest home designs from custom builders, project home companies, knockdown-rebuild specialists and kit-home suppliers who service Victoria. You'll receive 2 issues during a 1 year Build Home Victoria magazine subscription. You'll receive 2 issues during a 1 year Build Home Victoria magazine print subscription.